Living your healthiest life means setting goals and making time to exercise and plan meals. These are key steps towards achieving your goals. It’s also important to incorporate supplements to support your body with nutrients along the way! NUTRAPHASE provides a wide range of clean supplements from greens to protein powders to BCAA’s. The keto diet is making quite a stir in the world of weight loss. From celebrities to those diagnosed pre-diabetic, it’s often regarded as the holy grail. The original therapeutic ketogenic diet was used for pediatric epilepsy, providing just enough protein for growth and repair to maintain the correct weight for a child’s age and height. It lost momentum for quite sometime, but surged in popularity again in the mid-1990’s, thanks to a Hollywood producer whose son had severe epilepsy. The keto diet is high fat, medium protein and very low carbohydrate. In a standard diet, the body turns carbohydrates into glucose or sugar for usable energy. When there isn’t enough carbohydrates, the liver converts fats into fatty acids and ketone bodies. The body is now in ketosis, burning stored fat for energy! Many keto lovers find serious success dining on a menu of approximately 70% healthy fats, 20% protein and just 10% carbohydrates. The carb count comes in around 20 grams per day. Yes, VERY low, making it easy to see why dropping weight quickly is not challenging. It can take a few days to truly be in ketosis. Luckily, NUTRAPHASE has CLEAN KETONES to help you speed up the process. 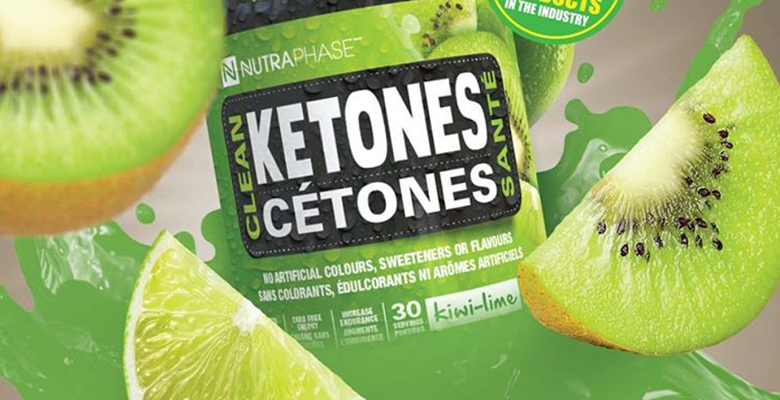 NUTRAPHASE took it a step further adding a few holistic ingredients. Green tea is antioxidant goodness, helping fight cell damage. Green tea has also been associated with weight loss due to the active ingredient EGCG, making it the perfect CLEAN KETONE companion. Ashwagandha is an ancient herb used in Ayurvedic Medicine for centuries. It’s referred to as an adaptogen, improving the body’s response to stress. Exercise and diet is a stress on the body! You will also notice Vitamin C, an immune boosting stress aid is on the list as well. Cucurmin is the most active compound in top-notch anti-inflammatory and anti-oxidant tumeric. To make sure it’s absorbed and utilized, a pinch of peperine or black pepper rounds out the CLEAN KETONES! Many people looking to lose weight on keto have found huge success. It just may be the answer for you! Changing your lifestyle is a positive step towards a healthier, happier you! Holistic tip: Increasing water intake is essential in keto. By limiting ALL carbs, the diet lacks fiber! 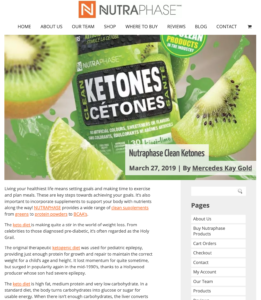 Constipation is one complaint in keto, making KETONES perfect as a flavorful boost for the necessary increase in water. Don’t forget NUTRAPHASE has energy and mind-boosting MCT-powder for your sunrise early start “keto coffee”.